Folklore survives when it’s multi-generational. Folklore dies when it ignores the young. And it’s impossible to have a living tradition without the presence of the older generation! These are the words of Mario Loiselle, who has been part of the traditional music world in Quebec for most of his life. Known especially for his piano accompaniment style, Mario has been sharing his love and knowledge of the music for decades. I first met Mario when we were fiddle students together at the Montreal School of Traditional Arts. Well, we were actually in different countries at the time and I was only able to enrol in the course because he agreed to take on the weekly task of emailing me the audio files from the course! I was lucky enough to hear some of his stories through our regular email contact, and I am delighted to now bring you this interview. Mario is articulate and astute in his observations, and is only too happy to share his love of music and piano accompaniment with other like-minded souls. So sit back and enjoy his stories for yourself! You are a self-taught pianist – what was your motivation and how did you learn? Yes, I am a self-taught pianist. I was born in 1953 into a modest family in a suburb of Montreal. My parents loved listening to the folk music of the time that was on television: Don Messer, Chez Isidore et Soirées Canadiennes. We had some records, especially of the Soucy Family. There was a piano at home. When I was 8 my parents paid for me to have lessons, but I hardly practised. I used to listen to the teacher and replay by ear everything he wanted me to learn. But I did tinker a lot and around 14 I started playing the pop music of the 1960s by ear. I was attracted to “modern” music, but despite this, never lost contact with folk music. At 19 I went to the First Festival of Quebecois Traditional Music where I heard Louis Pitou Boudreault and Antonio Bazinet for the first time. It was then that I really “connected” with the trad music of Quebec. I was especially drawn to the violin. I bought myself one and started playing, obviously by ear. I formed a dance band called La Bardasse. We had a dance caller as part of the band and we would play for popular festivals. 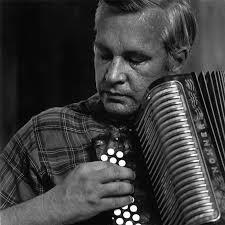 It was then that we met Philippe Bruneau, an accordionist who was very important in the resurgence of Quebecois folk music. He must have been about 45 then and we were 20. He passed on his passion to us, as well as his philosophy and approach. It was a privilege to be around him. Philippe had the skills, knowledge and experience of how to accompany the music on piano, and it was at that time that I decided to switch to piano accompaniment. Have you had any mentors or musical heroes over the decades? Obviously Philippe Bruneau, he was my way forward with accompaniment! I went to visit him many times. I would sit down at the piano and he with his accordion, and he would begin a tune. At a given moment he would stop and take a seat at the piano to show me the basics and the chord progressions, and to improve my technique and tone. Later on I accompanied him several times when he played for dances. That was always a rewarding experience. I listened to Yvan Brault, Philippe’s accompanist on two of his albums. 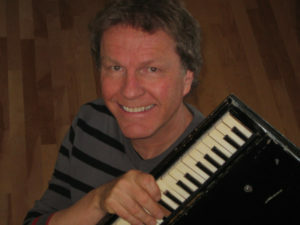 There was also Gilles Lozier, who accompanied Jean Carignan on his albums. I often visited Denis Pépin who accompanied Gabriel Labbé and Joe Derrane, among others. I listened a lot to Lise Verret who accompanied her father, Jules, and her brother, Jean-Marie. Her playing was as delicate as lace! But the pianist who has influenced me the most is Dorothée Hogan, who played with Philippe Bruneau in the 1980s. She was classically trained. Philippe harmonised and arranged the chosen repertoire, and Dorothée wrote it all down and so could reproduce the same arrangement at each concert. At this time, in 1980, I was involved in the recording of their concert at the Museum of Fine Arts in Montreal. I had in front of me two tracks that had been recorded, one with accordion, the other with piano. I could listen to the piano track separately and study the arrangement and harmonic progression. Then I could listen to the accordion track and add my accompaniment. And ever since this recording, I have learnt the fundamentals of piano accompaniment! You are a popular teacher at fiddle camps in Canada and the US. How do you teach students to accompany in the quebecois style? To accompany, my left hand plays the role of a double bass and plays the downbeat of each bar with the root, third or fifth of the chosen chord. This note is a single note, not played in octaves, generally played with the little finger, the thumb or another finger. I don’t play an octave in my left hand until I’ve produced a full-bodied sound with the bass. When you play in octaves, you ruin the effect of a double-bass by making the sound too sharp. You can use a walking bass and other effects. You need to use variations and avoid repetitive passages. The right hand, though, plays the role of a guitar and adds the up-beat. You need to place right-hand chords in the “sweet spot” of the piano, not too high where they’ll compete with the melody, and not too low where the sound is less defined. The sweet spot is between F, just below middle C and G, above middle C. To give you an example, I play D major using A below middle C, and D and F# above middle C.
Over the years I must have developed my own personal style. I could say that I use a simple style where I give each melody their own colour. I try to vary the harmonic progression and rhythm each time a motif is repeated, and I create unexpected variations. That’s a huge challenge to undertake each time! As well, I often use a tenor counterpoint melody that unfolds with the down beat of each bar. It’s played by the right hand thumb, index or middle finger, played lower than the melody. It’s a small melody or motif that adds another voice in a certain space on the piano, while following the rhythm of the left hand. 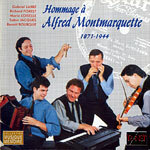 Have you always had a passion for the trad music of Quebec? Yes, you can say that. I have had some times where I haven’t played much, and those periods have made me realise how much I like playing piano accompaniment. When I find myself in jam sessions full of musicians, I am energised. I also love playing for dances, it’s fascinating to see people moving to the sound of our music. I play to children in schools. I love doing concerts. You can play Quebecois music everywhere. When I play, I go into a state of mind where nothing else matters except the music that I’m accompanying. That’s definitely a passion! Can you tell us a little about the resurgence of folk music in Quebec in the 1970s? I have a feeling, in spite of everything, that each generation which has come before us has successfully passed on the music, songs and dances to the next generation. We tend to think, probably incorrectly, that there was a big gap [in folk music] in the 1960s. But the gap was probably more imagined than real. The young generation in the 1970s – we thought that we were the generation of a truly new beginning. That Time had been reset to zero. But what we didn’t know was that everything had been left in place: there were already active musicians, there was dancing in the villages, music collecting and archiving had already taken place, musicians of importance had made recordings. In short, you only had to look around to see that everything was there. There had been no break. As for me, I lived in the city and hardly knew anything about this world of traditional music. 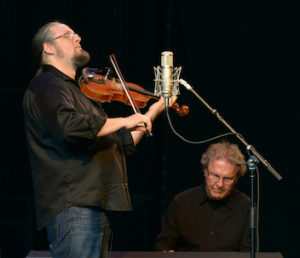 The turning point came at the beginning of 1973 with the Festivals of Traditional Music organised by André Gladu at the University of Quebec in Montreal. That’s where I heard authentic music for the first time. It was also the springboard for the young bands, La Bottine Souriante and Le Rêve du Diable. But the older players were still part of the movement (Louis Pitou Boudreault, Jos Bouchard, Philippe Bruneau), and the generations intermingled. So you could say that the 1970s succeeded in sparking the interest of its youth in trad music. It created an inclusive movement where the older players were still active participants and the younger ones were able to express their creativity. Folklore survives when it’s multi-generational. Folklore dies when it ignores the young. And it’s impossible to have a living tradition without the presence of the older generation! 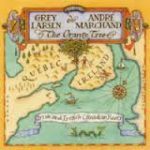 For any readers who are new to Quebecois music, who do you recommend to listen to? 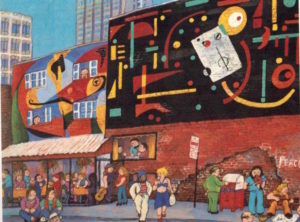 A picture by artist Tanobe, showing Quebec’s National Day in 1976, in Montreal. Mario’s band , La Bardasse, is playing in the right hand corner. Mario is the figure in blue playing the violin! That’s a big question. I could put forward 100 albums, but I’ll suggest…4! Musée des Beaux-Arts, Montréal, 13 novembre 1980. ©2001 Les productions de la chaise porteuse / SPDTQ. Two musicians at their best. A choice repertoire and original piano arrangements. Contact TradChat if you would like more details about this recording. Solo violin repertoire, and sophisticated piano accompaniment. Hopefully I’ve helped you to appreciate the traditional music of Quebec and its piano accompaniment. Tu es un pianiste autodidacte. Pourquoi as-tu décidé d’apprendre le piano, et comment tu l’as fait ? Oui, je suis un pianiste autodidacte. Je suis né en 1953 dans un milieu modeste, en banlieue de Montréal. Mes parents aimaient beaucoup écouter la musique folklorique de l’époque à la télévision : Don Messer, Chez Isidore et Soirées Canadiennes. On avait quelques disques vinyles, surtout de la famille Soucy. Il y avait un piano à la maison. Mes parents m’ont payé quelques leçons quand j’avais 8 ans mais je pratiquais peu. J’écoutais le professeur et je rejouais à l’oreille ce qu’il voulait que j’apprenne. Je pianotais quand même assez souvent et vers 14 ans, j’ai commencé à jouer à l’oreille les musiques populaires des années 60. Les musiques plus « modernes » m’attiraient mais malgré tout, je n’ai jamais perdu contact avec la musique folklorique. À 19 ans, j’ai assisté au Premier Festival de Musique Traditionnelle du Québec où j’ai entendu pour la première fois Louis Pitou Boudreault et Antonio Bazinet. C’est là que j’ai vraiment « connecté » avec la musique traditionnelle du Québec. Le violon m’attirait particulièrement. Je m’en suis acheté un et j’ai commencé à jouer, évidemment à l’oreille. J’ai formé un groupe, La Bardasse, une formation pour la danse. Nous avions un calleur et nous jouions pour les fêtes populaires. Nous avons alors fait la rencontre de Philippe Bruneau, un accordéoniste très important dans le renouveau de la musique folklorique québécoise. Il devait avoir 45 ans alors que nous avions 20 ans. Il nous a transmis sa passion mais aussi sa philosophie, son approche. C’était un privilège que de le côtoyer. Philippe avait des compétences, des connaissances et une expérience d’accompagnement au piano. C’est à ce moment que j’ai décidé de faire la transition vers le piano d’accompagnement. Avais-tu des mentors musicaux au fil des années ? Évidemment Philippe Bruneau, c’était la voie à suivre pour l’accompagnement ! Je suis allé plusieurs fois chez lui. Je m’installais au piano et lui à l’accordéon et il partait une mélodie. À un certain moment, il s’arrêtait et s’installait alors au piano pour me transmettre des principes, pour me faire découvrir des suites d’accords, pour améliorer ma technique et ma sonorité. Par la suite, je l’ai accompagné plusieurs fois pour des veillées de danse. C’était toujours une expérience très enrichissante. J’ai écouté Yvan Brault, l’accompagnateur de Philippe sur ses 2 disques Philo. Il y a eu Gilles Lozier, l’accompagnateur de Jean Carignan pour les disques Philo. J’ai fréquenté Denis Pépin qui a entre autres accompagné Gabriel Labbé et Joe Derrane. J’ai beaucoup écouté Lise Verret qui accompagnait son père Jules et son frère Jean-Marie. C’était de la dentelle ! Mais le piano qui m’a le plus influencé, c’est celui de Dorothée Hogan, la pianiste de Philippe dans les années 80. C’était une pianiste de formation classique. Phillipe harmonisait et arrangeait le répertoire choisi, Dorothée écrivait tout ça et était capable ensuite de reproduire à chaque concert ce qui avait été décidé. À cette époque, en 1980, j’avais participé à l’enregistrement de leur concert au Musée des Beaux-Arts de Montréal. J’avais à ma disposition un enregistrement 2 pistes avec la piste accordéon d’un côté et la piste piano de l’autre. Je pouvais écouter seulement la piste piano et étudier l’arrangement et la marche harmonique. Ensuite, j’écoutais seulement la piste accordéon en y ajoutant mon accompagnement. J’ai appris l’essentiel de l’accompagnement au piano à partir de cet enregistrement ! J’ai écouté les guitaristes, surtout André Marchand. J’aimais l’espace et les atmosphères qu’ils créaient. En 1999, j’ai découvert un groupe de jeunes américains, Popcorn Behavior, avec Thomas Bartlett au piano. Ça décoiffait ! Évidemment, c’étaient des artistes dotés d’une grande créativité combinée à une excellente technique musicale. Ils étaient dans une classe à part ! Ça m’a inspiré. Tu es un enseignant populaire aux camps de musique trad au Canada et aux Etats-Unis; comment tu enseignes aux étudiants d’accompagner dans le style québécois? Pour accompagner, ma main gauche tient le rôle de contrebasse et joue les temps forts (down beat) de chaque mesure avec la fondamentale, la tierce ou la quinte de l’accord choisi. Elle joue une note seule, non-doublée, généralement avec l’auriculaire, le pouce ou un autre doigt. Je ne double pas la note de ma main gauche afin de produire un son avec un maximum de rondeur. En doublant la note, on rajoute de harmoniques trop aigues qui brisent l’effet de la contrebasse. Il peut y avoir des « walking bass » et autres effets. Il faut des variations et éviter les partons répétitifs. Par contre, ma main droite tient le rôle de la guitare et répond à la main gauche sur le haut du temps (up beat). Elle plaque l’accord dans la section des médiums, ni trop haut pour ne pas nuire à la mélodie, ni trop bas pour ne pas générer un son mal défini. Cette zone de confort pour la main droite se situe entre le FA en bas du DO central jusqu’au SOL au-dessus du DO central. À titre d’exemple, ma position de l’accord RÉ majeur serait LA en bas du DO central avec le pouce, RÉ au-dessus du DO central avec l’index et FA# au-dessus du DO central avec le majeur. L’auriculaire, à l’octave, est prêt à intervenir au besoin. Au fil des ans, j’ai dû développer un style assez personnel. Je pourrais dire que j’utilise un style simple où pour chaque mélodie, je propose une couleur spécifique, qui lui est propre. J’essaye aussi à chaque reprise du thème, en improvisant, de varier la marche harmonique et l’allure rythmique. Je crée des contrastes inattendus. C’est un beau défi à relever à chaque fois ! De plus, j’intègre souvent un contre-chant qui se développe sur le temps fort (down beat) de chaque mesure. Ce contre-chant est au-dessus de la basse et généralement au bas de l’accord. Il est joué par le pouce, l’index ou le majeur de la main droite. C’est un motif, une petite mélodie qui vient rajouter une autre voix dans un espace particulier en suivant le rythme de la main gauche. Est-ce que tu as toujours été passionné par la musique trad? On peut dire que oui. J’ai déjà eu quelques périodes où je jouais moins, mais depuis, je sais que j’adore accompagner au piano. Me retrouver dans des jams, avec plein de musiciens et musiciennes, ça me procure énormément d’énergie. J’adore aussi jouer pour les danses ; c’est fascinant de voir les gens bouger au son de notre musique. Je joue beaucoup dans les écoles pour les enfants. J’aime faire des spectacles. La musique québécoise peut se jouer partout. Quand je joue, j’entre dans un état d’esprit où rien n’est plus important que la musique que j’accompagne. C’est vraiment une passion ! Peux-tu nous décrire un peu la résurgence de la musique folk au Québec dans les années 70? J’ai l’impression, malgré tout, que chaque génération qui nous a précédé a réussi à transmettre à la génération suivante la musique, les chants et les danses. On pense peut-être à tort qu’il y a eu un gros fossé dans les années 60. Le fossé était probablement plus dans la tête des acteurs de cette génération que dans la réalité. La génération des années 70, c’était la génération des jeunes. Nous pensions que nous étions la génération d’un vrai nouveau départ. La grande horloge du temps était remise à zéro. Mais tout avait été laissé en place, à notre insu : il y avait encore des musiciens actifs, ça dansait encore dans les villages, des grands collectages avaient été entrepris, les musiciens importants avaient fait des enregistrements. Bref on n’avait qu’à regarder et tout était là. Il n’y avait pas eu de coupure. Moi, je venais de la ville et je connaissais peu de choses de cet univers traditionnel. Le moment déclencheur, ce sont, à partir de 1973, les Festivals de Musique Traditionnelle organisés par André Gladu et l’Université du Québec à Montréal. C’est là que j’ai entendu l’authenticité pour la première fois. Ce fut aussi le point de départ des groupes de jeunes avec le Rêve du Diable et La Bottine Souriante. Mais les anciens sont restés dans le mouvement (Louis Pitou Boudreault, Jos Bouchard, Philippe Bruneau). Et le mélange des générations a opéré. Donc, on peut dire que les années 70 ont réussi à intéresser les jeunes de l’époque à la musique traditionnelle du Québec en créant un mouvement inclusif où les plus vieux sont restés actifs et où les plus jeunes ont pu exprimer leur créativité. Les folklores qui vont survivre sont ceux qui favorisent la coexistence intergénérationnelle. Les folklores qui mourront sont ceux qui n’ont pas su faire une place aux jeunes. Et il ne pourra y avoir de folklores vivants sans la présence des plus vieux ! Pour les lecteurs qui sont novices avec la musique québécoise, qui recommandes-tu d’écouter? La Bardasse sur le Mont-Royal en 1976 pour la fête nationale avec 300,000 personnes. C’est moi au violon! Tanobe, une artiste montréalaise, s’est inspiré de la photo pour illustrer le Montréal de l’époque. C’est une grande question. Je pourrais mettre 100 titres mais je t’en suggère…4 ! Veuillez contacter TradChat pour plus d’info sur ce disque. J’espère avoir pu vous faire apprécier la musique traditionnelle québécoise et en particulier l’accompagnement.